Professor Florence Nwanzuruahu Nkiru Nwapa (13 January 1931 – 16 October 1993) known to her native Nigerian ndi-Igbo people as Ogbuefi Florence Nwanzuruahu Nkiru Nwapa-Nwakuche and the world as Flora Nwapa was a great Nigerian writer (novelist), teacher, administrator, and a forerunner of a whole generation of African women writers. Flora Nwapa is best-known for re-creating Igbo life and traditions from a woman’s viewpoint. With Efuru (1966) Nwapa became black Africa’s first internationally published female novelist in the English language. She has been called the mother of modern African literature. She was a contemporary of the legendary Ghanaian playwright Dr Efua Theodora Sutherland (27 June 1924—2 January 1996) who published her first literary work ‘Foriwa’ (1962), and others such as Edufa (1967), and The Marriage of Anansewa (1975). She also is known for her governmental work in reconstruction after the Biafran War. In particular she worked with orphans and refugees that where displaced during the war. Further she worked as a publisher of African literature and promoted women in African society. What is not known, however, is that by putting the children of of Ogbuide into print, Nwapa who is also a poet, short story writer, and children’s author was able to tell her own story, and release her own anxieties and feelings of disenchantment with a society that :destroys its gifted females.” Flora Nwapa`s women -centered text evolve from the myth of Ogbuide – the female deity of Oguta people- who symbolizes beauty, wealth, power, and self-fulfillment for her children, especially the women. For Nwapa ability to write implied a measure of autonomy, an ability to shun passivity and acquiescence in the face of mistreatment and injustice. Writing also enable Nwapa to exercise some control over the circumstances of her life. Her books explore frustrations associated with love and sexuality, they emphasize simultaneously the individual and the collective nature of personal relationships. This intermingling of the private and public, personal and political, is present in most of her novels. Themes of female empowerment, male-female relationships, sexual abandonment, culture-conflict, as well as expressions of female desire and sexuality, and hope reflect the pulse of Ugwuta women`s lives. Criticism of her work is often influenced by feminist politics because of the woman-centered nature of her fiction. Her work holds an important place in feminist discourse but has also garnered attention for its literary merits. She herself said “When I do write about women in Nigeria, in Africa, I try to paint a positive picture about women because there are many women who are very, very positive in their thinking, who are very, very independent, and very, very industrious.” (from an interview with Marie Umeh, 1995).Nigerian novelist). Florence Nwanzuruahu Nkiru Nwapa was born in 13 January 1931 at Oguta, an igbo town in eastern Nigeria, which was then a British colony. Both of her parents, Christopher Ijeoma and Martha Nwapa, were teachers. She was educated at the University of Idaban, receiving her B.A. in 1957. Nwapa continued her studies in England, earning in 1958 a degree in education from the University of Edinburgh. After returning to Nigeria in 1959 Nwapa worked as an education officer in Calabar for a short time, and then she taught geography and English at Queen’s School in Enugu. From 1962 to 1964 Nwapa was an assistant registrar at the University of Lagos. During the Nigerian Civil war, which broke out in 1967, she left Lagos with her family. Like many members of the Igbo elite, they were forced to to return to the eastern region after the end of the conflict. Nwapa served as Minister for Health and Social Welfare for the East Central State (1970-1971). Her tasks included finding homes for 2000 war orphans. Later on she worked for Commissioner for Lands, Survey, and Urban Development (1971-1974). In 1982 the Nigerian government bestowed on her one of the country’s highest honors, the OON (Order of Niger). By her own town, Oguta, she was awarded the highest chieftaincy title, Ogbuefi meaning “killer of cow”, which is usually reserved for men of achievement. Besides writing books, Nwapa established Tana Press, which published adult fiction. It was the first indigenous publishing house owned by a black African woman in West Africa. Between 1979 and 1981 she produced eight volumes of adult fiction. Nwapa set up also another publishing company, Flora Nwapa and Co., which specialized in children’s fiction. In these books she combined Nigerian elements with general moral and ethical teachings. As a business woman, she also encouraged with her own example to break the traditional female roles of wife/mother and strive for equality in society. However, Nwapa did not call herself a feminist but a “womanist,” a term coined by the American writer Alice Walker in her collection of essays, In Search of My Mother’s Garden: Womanist Prose (1983). As well as being a distinguished member of PEN International and the Commonwealth Writer’s Awards committee, she was also the President of Association of Nigerian Authors (ANA). In 1989, she was made a Visiting Professor of Creative Writing at the University of Maiduguri and remained so till her death. Appearing in 1966, Flora Nwapa`s Efuru was the first internationally published book, in English, by a Nigerian woman. Efuru is based on an old folktale of a woman chosen by gods, but challenged the traditional portrayal of women. 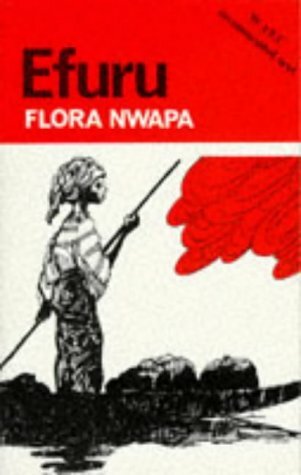 Efuru, which Nwapa started to write in 1962. The Promised Land by the Kenyan Grace Ogot appeared also in 1966; both works were path-breakers. Nwapa sent to manuscript to her good friend Chinua Achebe in Lagos and after some editorial suggestions, Achebe sent it to Heineman Educational Books for publication in the African Writers Series (No. 56). Nwapa sets her story in a small village in colonial West Africa as she describes the youth, marriage, motherhood, and eventual personal epiphany of a young woman in rural Nigeria. The respected and beautiful protagonist, an independent-minded Ibo woman named Efuru, wishes to be a mother. Her eventual tragedy is that she is not able to marry or raise children successfully. Alone and childless, Efuru realizes she surely must have a higher calling and goes to the lake goddess of her tribe, Uhamiri, to discover the path she must follow. The work, a rich exploration of Nigerian village life and values, offers a realistic picture of gender issues in a patriarchal society as well as the struggles of a nation exploited by colonialism. The novel has at its core fundamental feminist concepts like women’s agency, women’s empowerment, sisterhood and gender equality. However, in an interview by Marie Umeh in 1993, Flora Nwapa refused to be called a feminist; she said, “I don’t even accept that I’m a feminist. I accept that I’m an ordinary woman who is writing about what she knows. I try to project the image of women positively.” (Umeh 27). By looking at her novels which include in addition to Efuru, Idu (1970), Never Again (1975), One is Enough (1981), and Women are Different (1986), one can see that Nwapa is a writer who dedicated her efforts to discuss women’s issues of struggle, quest for independence and success in their native patriarchal Igbo culture. However, she did not call herself a feminist writer because, in my viewpoint, her writings do not qualify in the Western criteria of feminism to be called feminist. The concept of feminism as a movement and a school of thought seemed to exclude the black woman from its agenda. Thus, in order for a work of art to be considered feminist, it must, according to the Western criteria, abide by a set of rules, and to mention some, these can be like showing the rebellion of women towards their own cultures and traditions and showing how they refuse to succumb to patriarchal practices and attempt to overthrow the whole hierarchy. Nwapa’s second novel, Idu (1970), was also a story about a woman, whose life is bound up with that of her husband. When he dies, she choices to seek him out in the land of dead rather than live without him or prefer motherhood to anything else. The critical reception was mainly hostile. Eustace Palmer in African Literature Today and Eldred Jones in The Journal of Commonwealth Literature compared it with Elechi Amadi’s The Concubine (1966), also published in the African Writersn series (No. 25), but not in Nwapa’s favour. 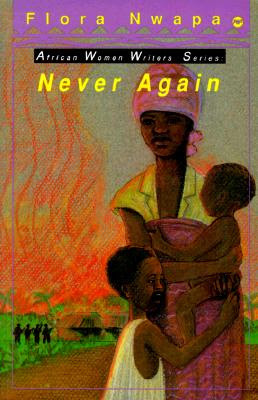 The war novel, Never Again (1975), drew its material from the Nigerian Civil War (see also Chinua Achebe’s Beware, Soul Brother, 1971, a collection of poems, and Elechi Amadi’s Sunset in Biafra, 1979). The protagonist, Kate, who starts as a supporter of the Biafran cause, ends struggling simply to survive. Wives at War, and Other Stories (1980) dealt with the Biafran conflict. Nwapa wrote short stories, poetry and children’s books, such as Mummywater (1979), which brought to life a water deity – the water goddess Ogbuide or Uhamiri appeared also in her adult fiction; Mummywata was her westernized Igbo counterpart. A central theme in her fiction was childlessness, from her early novels to Women Are Different (1986), in which her four major female characters choose between such options as self actualization in their career and the marriage institution, life in the town and in the country. “Her generation was telling the men, that there are different ways of living one’s life fully and fruitfully,” one of the women concludes. “They have a choice, a choice to marry and have children, a choice to marry or divorce their husband. Marriage is not THE only way.” Noteworthy, spinsterhood without children is not a positive option and Nwapa never had the interest to deal with the theme of lesbianism. Flora Nwapa died on October 16, 1993 in Enugu, Nigeria. Until her death she was a visiting professor and lecturer at numerous colleges in the U.S. and Nigeria. Nwapa was married to Chief Gogo Nwakuche, a business man; they had three children. She remained Nwakuche’s first wife, although he took other wives. Because she wanted her children to have a father, she did not leave or divorce him. At the time of her death, Nwapa had completed The Lake Goddess, her final novel, entrusting the manuscript to the Jamaican Chester Mills. This work focused on the lake goddess Mammy Water, the eternal spring and mythical inspirer of Nwapa’s fiction. Legends tell that the fairy godmother has her adobe on the bottom of Oguta Lake, near the author’s birthplace. Flora Nwapa is the subject of a documentary entitled The House of Nwapa, made by Onyeka Nwelue,that premiered in August 2016.